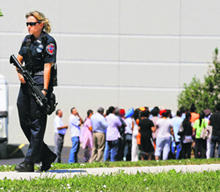 Six persons were killed in an attack on a gurdwara during Sunday morning prayers in Wisconsin by at least one gunman who was also shot dead, the police said. Haryana Minister of State for Home Gopal Kanda was in the dock today after a former woman employee of his now defunct airline MDLR committed suicide accusing him of �mentally harassing� her. Prime Minister Manmohan Singh is likely to hold a crucial bilateral meeting with Pakistan President Asif Ali Zardari later this month on the fringes of the NAM Summit in Iran. With the Monsoon session of Parliament beginning this week, the Manmohan Singh Government will have the opportunity for a fresh round of reality check on which way the political wind is blowing, facing as it does intra-coalition fissures and Opposition onslaught. Amid speculation that all is not well between him and Gujarat Chief Minister Narendra Modi, senior BJP leader L K Advani today caused ripples in political circles by stating that a non-Congress, non-BJP Prime Minister supported by one of these two principal parties was �feasible� after the next Lok Sabha elections.